OK, so you’re waiting for the hard sell. Well we have it all here. The biggest roof terrace bar in Medellin with the best graffiti you’ve probably ever seen in your life (check out the photos). Our British owner has lived here for 5 years and backpacked all through South and Central America and is like the Yoda of all things Colombia. Ask him anything (apart from where babies come from – he’s still not too sure about that one. He has a theory about a stork but we digress). Every bed has 4 (yes 4) plug sockets including two in your huge locker. Our dorm rooms are spacious and ample to swing a cat in (we suspect that you could swing a tiger in there but have never tried). For those who hate the idea of human interaction, our 2 WIFI networks give access to important information like what kind of potato you are, and you will never be left in the dark about what your friends have had for dinner. Want to book a tour? Easy. Want to be 5 minutes from the Metro and nightlife? Done. Want to put on a dress and call yourself Susan? Hey it’s all good. Still reading? It’s time to make that reservation and get back to more important things. We have a lot of preparing to do before the zombie apocalypse. Check out before 12:00 midday. The Purple Monkey was home to me for about two weeks and probably one of my favourites in Colombia. 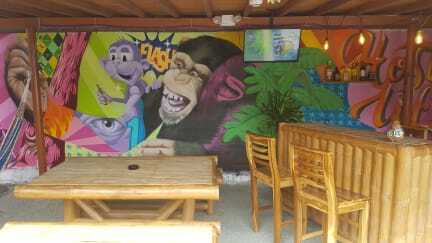 The bar and patio is the PERFECT place to meet fellow backpackers. This hostel managed to strike the perfect balance when it comes to social spaces and alone time spaces which is key! Also the staff, especially David, is so wonderful, I know you will love it here! hot showers! Big lockers, clean space, awesome vibe. Super fun pub crawl. Would def stay again! Amazing place for social solo travelers! Booked 3 nights and ended up staying 6. 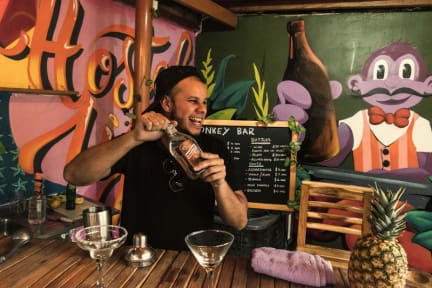 The place is cleaned constantly, the staff is pretty friendly, and the location is perfect (in El poblado but a short walk to parque lleras where more action aka noise is). Great hostel for solo travellers. Wouldn't call it a party hostel but definitely social and so easy to meet people. In a quieter spot in Manila but easy walk to the nightlife of El Poblado. Rooms and bathrooms are clean, kitchen is also really clean and spacious. Quite expensive but most hostels in this area are. Wifi can be a bit spotty at times but otherwise no complaints! Pros: Small hostel with free breakfast and good wifi, great location close to a lot of good restaurants and a short walk to the clubs and bars. The hostel bar is a good place to meet people and the prices are very reasonable. Cons: only negative was the bed was as hard as a rock and not that comfortable to sleep in, the rooms can also get a bit warm as their is no air con. Absolutely loved my stay. Super socialable hostel without being wild. It’s spotlessly clean and in a great location. Definitely recommend! Great social hostel. But of a party vibe but after 12pm it is always calm so sleep is granted. Staff is awesome and rooftop bar is good to socialise. Very clean facilities. Buen hostel. Ideal para viajar solo ya que tiene una onda ideal para conocer gente.